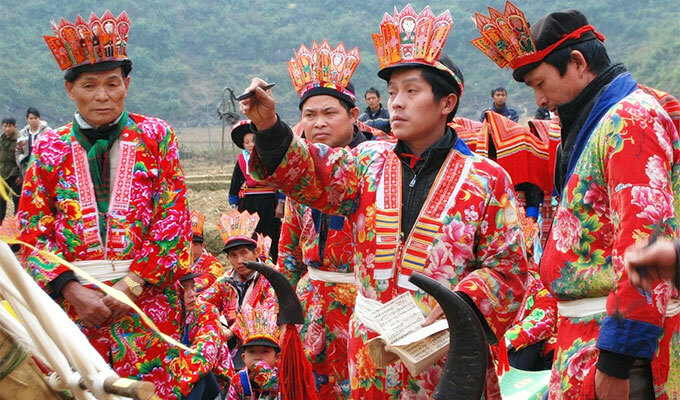 The cap sac (maturity ritual) of the Dao ethnic group may be recognised by UNESCO as Intangible Cultural Heritage. Associate Professor Bui Hoai Son, deputy director of the Vietnam Institute of Culture and Art Studies, said that authorities in Tuyen Quang Province, where a big number of Dao people live, would ask the Government and the Ministry of Culture, Sports and Tourism to develop a national dossier on the ceremony for submission to the UN group. Mr. Son was speaking at a conference in the province this month on preserving the cultural identity of the Dao ethnic group. Statistics in 2010 showed Viet Nam has more than 800,000 people of Dao ethnicity. Most live in Tuyen Quang and Ha Giang. The cap sac ritual, a rite of passage declaring the coming-of-age of Dao men, was declared a national intangible cultural heritage at a ceremony held in Thai Nguyen Province in March last year. “This is the most important ritual ceremony in the life of a Dao man,” said Nguyen Thi Song Ha, from Viet Nam Academy of Social Sciences. “It is important to preserve the tradition as more and more young Dao people approach modern technology to help them in the world outside. But this means they can also forget their traditions,” she said. The ritual is indispensable for Dao men to be recognised as adults. Legend has it that Dao ancestors were living in mountainous areas when devils appeared, killing people, eating livestock and destroying crops. The Jade Emperor sent heavenly fighters to earth to kill them, but they could not wipe out the devils because there were too many. As earthly people without magic could not defend themselves against the devils, the Jade Emperor asked deities to pass magic to male villagers and grant them the title “sorcerer”. These sorcerers together with heavenly fighters finally killed all the evil spirits. After that, the Jade Emperor gave the order to grant the title of sorceror to married men to protect people from evil spirits. The cap sac ritual was formed since then and still continues. Only after passing the cap sac is a Dao man is considered to be mature. An old man who doesn’t pass this ritual has to sit with children on all important occasions. In Dao society, only people passing the cap sac ritual can become family owners, village heads and worship ancestors. A person who doesn’t pass this ritual is believed not to be able to control his spirit, which consequently will hurt the destiny of his offspring. People passing this ritual are believed not to be harmed by devils when they die. Dao people believe that a Dao man, who passes the ritual is considered as “grown up” even though he is still young. He can join important events of the community in the village. He can become a teacher, sorcerer, medical practitioner. These are the three jobs considered important for Dao people. For these reasons, no matter how rich or poor he is, a Dao man must be initiated. A Dao man usually passes the cap sac ritual when he is between 10 and 16 years old. The ritual must be held in the order of a man’s position in the family: the father must have this ritual before his son and an older brother must do it before his younger brother. In the days of the ritual, traditional dances are performed by villagers for hours to the sounds of cymbals, drums, depicting historical events, farm work, house building and other daily-life activities. The coming-of-age ceremony often takes place in the first, eleventh or twelfth lunar month of the year when locals enjoy free time after the harvest. The ritual ceremony is prepared by the family of the men and all the village one year before the day the ritual is held. This work requires the help of family, friends, and neighbours. The cultural practice features many stages including a welcoming-ceremony and a thanksgiving ritual to the ancestors, the presentation of offerings, musical performances and rounding off the ceremonial ritual.